Londonist ask that most pressing of daily concerns: where to go on your lunch break. With over 50 locations throughout greater London, we’re sure many of our readers know the drill at all-pervading fast-casual chicken joint, Nando’s: decide where to sit and take a number; after deciding where to sit, place your order at the front counter and then sit back down; wait for it to be brought to your table. This model works well except, perhaps, if you’re dining alone and carrying bags. You’ll also need to decide what spice-level you would like your Portuguese flame-grilled peri-peri chicken to be: lemon and herb (wimp), medium (yawns-ville), hot (water! water! ), or extra-hot (yeow!!!). What’s peri-peri? African Bird’s Eye Chilli. 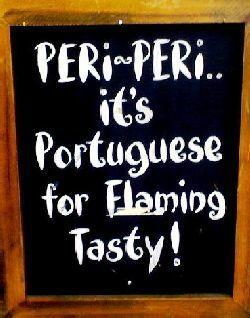 More on that can be found at the 'Experi-perience' page of the Nando’s website. And if flame-grilled chicken’s not your thing, well, you’re probably better off elsewhere, but the menu does have a variety of non-poultry options. Not sure how spicy you want your food? Play it safe with your order and then grab a bottle of a hotter sauce at one of Nando’s self-service kiosks, where you’ll also find utensils, napkins, fountain drinks, condiments and the like. The last Londonist lunch at Nando’s consisted of five chicken wings with a salad (rather than two sides), which proved to be a pretty excellent choice for lunch. The wings were prepared with hot peri-peri sauce with extra-hot on the side for a bit of an endorphin rush. Photography by Sasha Frieze at Sashinka.